The forecasted high temperature next week is not expected to exceed 95 degrees. That is right, Texas, it’s fall! To celebrate the season and Johnson’s Backyard Garden’s bumper crop of sweet potatoes we have created several delicious recipies perfect for a sub-100 day. Fresh sweet potatoes are denser, sweeter, and creamier than any other version I have ever had. If you have the chance to use fresh local sweet potatoes you might find it hard to go back to anything at the supermarket. But before we get to the recipes I would like to talk a little more about sweet potatoes. 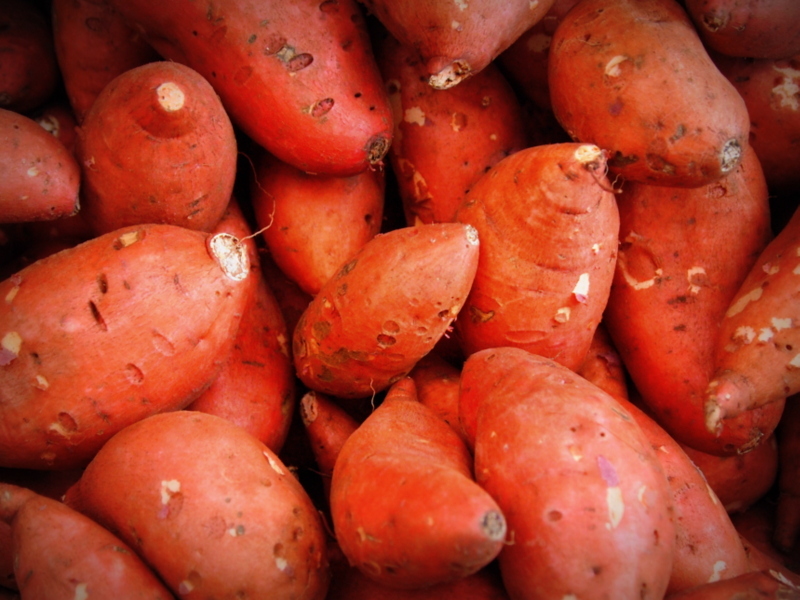 Like all potatoes, sweet potatoes are native to the Americas where evidence of the tubers date back to 8000 BC. About 1,00 years ago sweet potatoes were introduced to Polynesia by South Pacific explorers and 500 years ago or so the first Europeans had their taste. Varieties of sweet potatoes are now popular in most tropical and sub-tropical regions of the world and are an important source of nutrition for billions of people. Sweet potatoes are rich in vitamin B6, C, and, in the case of orange sweet potatoes, vitamin A. They are so packed in nutrients that they are on the front lines of battling malnutrition in parts of Africa. It should also be noted that while we use the terms interchangeably in the United States, yams and sweet potatoes are completely different plants. That said, the flavor and usages are very similar so please continue calling them whatever you want. To start this season’s sweet potato feast we made a Sweet Potato Salad with black-eyed peas and a lemon dressing. Then I made a Sweet Potato Shepherd’s Pie with mushrooms, peppers, and Walnut Gravy which is great for these “colder” days. Then I experimented with some Sweet Potato Cookies which were simple and delicious. James whipped up a Sweet Potato and Peanut Stew which might have been the best of show. Finally, we made some Sweet Potato Barley Burgers which would do fantastically for a burnt (or golden brown) orange cookout.